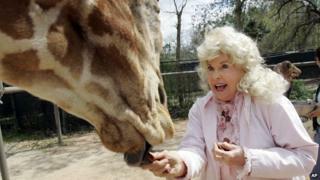 US actress Donna Douglas, best known for playing the tomboyish Elly May Clampett in 1960s sitcom The Beverly Hillbillies, has died at the age of 82. The Louisiana native appeared in more than 270 episodes of the popular show, which followed a family who relocate to Beverly Hills after discovering oil. She also starred in the famous Twilight Zone episode, The Eye of the Beholder. Douglas died on New Year's Day in Baton Rouge, the state capital of Louisiana. According to her niece, the cause of death was pancreatic cancer. Typically clad in a snug flannel shirt and tight jeans, Elly May was blissfully unaware of her blond bombshell status. The actress described the character, whom she played from 1962 to 1971, as "a slice out of my own life". "I was raised a tomboy, with one older brother and all male cousins," she told a Kansas newspaper last March. "So I grew up swinging from vines and playing softball." Before The Beverly Hillbillies, she was seen in supernatural drama The Twilight Zone as a beautiful woman who undergoes plastic surgery. The twist in the tale is that her procedure is considered a failure, her world consisting of people with uniformly deformed features. Douglas starred opposite Elvis Presley in his 1966 film Frankie and Johnny and had a small role in Lover Comer Back, a 1961 comedy starring Doris Day and Rock Hudson. After The Beverly Hillbillies she worked in real estate, recorded country and gospel music albums and wrote a book for children that drew on biblical themes. Born Doris Smith in 1933, Douglas began her career in beauty pageants before travelling to New York to pursue a career in entertainment. She was married twice and is survived by Danny Bourgeois, her son from her second marriage.